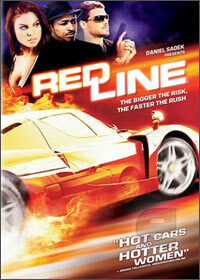 With almost perfect timing with the latest Fast and Furious movie, Redline arrives on DVD that features fast cars, women and a healthy amount of testosterone driven action. Of course some would say it's a clichéd illegal street racing movie but I digress as it gives the viewer the perfect if somewhat forgettable escapism for a few hours. Starring the almost perfect Nadia Bjorlin as "Nat" who is the penultimate tomboy, this foxy street racer knows everything about fast cars from not only fixing them but also racing them. Unfortunately for Nat, she is forcefully dragged into the deadly world of illegal street racing and from there sparks begin to fly. Guns, racing and action is what happens next. Apart from Bjorlin, the star of this movie is the amazing action sequences that simply look stunning on our high definition TV that is equally matched with the Dolby Digital 5.1 surround sound. At times, the stunts look almost "fake" through the sharp images and vibrant colour palette that is truly a surreal racing experience. Needless to say, although the acting is stereotypical for a movie like this, the races are actually exhilarating. A fun race from start to finish!